Every new user interface takes a while to learn and get used to. Just as it is when you move to a new home where you will find your old drawers, wardrobes, furniture, and rooms all in different places and as with every change, it takes a while to get your head around it. This is the same for Microsoft Word Online. You may have noticed here that there are some things there and some things are aren't. If you have looked in the options on Word Online, you may have realised that the 'Send using email' function that you are used to is not available. Instead when you click on File then Share, you see the options "Share with people", "Embed" but no direct function to email the document you have written to someone**. So how to we email a document on Microsoft Word Online? 2. Click on Documents and find your document. In this example this is "Test document.doc"
4. A menu will pop up showing you the actions you can do now. Now that you have downloaded a copy of the document to your computer, all you need to do now is simply find the document you have just downloaded and email it out as you would when you normally attach attachments for your emails. Click on "Insert" followed by "Files as attachments"
5. 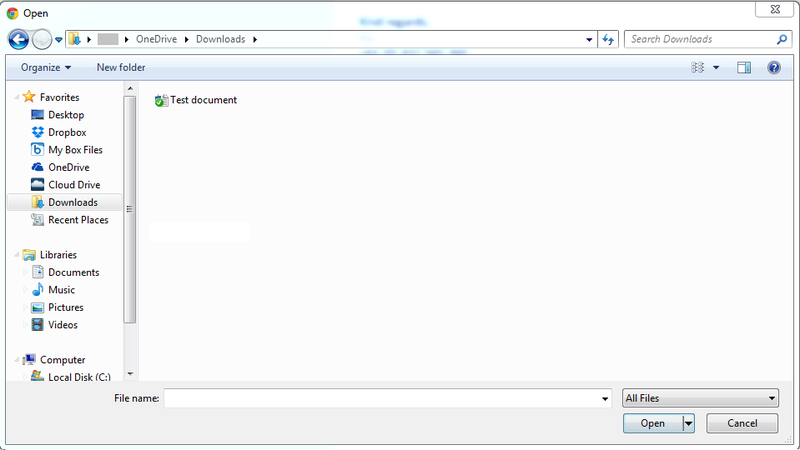 Find the document file, select and attach it (Click "Open" when you have found it). In this example, the file that we have downloaded is called "Test document". 6. Just fill in the rest of your email and you are pretty much set to send your document via email. Well done! *This will only be available if you have been writing a document online on Word Online. As all documents that you work on, on Microsoft Office Online will be automatically stored on your own OneDrive on Microsoft's servers. These will be accessible anywhere you have an internet connection and your log in details. **Share from OneDrive will only share a link to the file and allow you to let whoever you send the link to "Edit" or "View" only the file. This is great if you want to work on a document together online (and edit it in real time! ), but for most people who may not be as tech savvy or users of OneDrive or Word Online, it may be easier to send them a traditional document via email. It's completely up to you which method you would like to try.